Reprinted from TWA Ambassador Magazine with permission of the author and publisher; copyright 1982 by Trans World Airlines, Inc.
Much has happened in the turbulent ten-year history of Atari. Hi-Res wants to take this premiere opportunity to recap this corporate bantom-weight's emergence as a muscle-bound profit maker. The following is one of the best accounts we've read of how a spare change operation grew into a billion dollar entity. But much has happened since the article was written. Atari's market share for video games has dropped, just as its share of the home computer market has grown. Pre-release jitters and bugs delayed the entry of the 1200XL. And founder Nolan Bushnell, flush with cash from Chuck E. Cheese Pizza, is heading a new robotics firm. This year he will be free of his non-competitive agreements with Atari, and has indicated he will return to the video game market. The announcement didn't sit well with Atari. They promptly sued Bushnell, saying he unfairly came out swinging before the bell. Atari said that Bushnell has already sought financing for his competitive, but unnamed, product. Hi-Res will be following closely the further exploits of Atari in follow-up articles.--Eds. Atari means "you are about to be engulfed." An Oriental equivalent of "Checkmate," it's the traditional endgame warning offered to one's opponent in Go, the Japanese game of strategy. Appropriately, it's also the name of the world's largest producer of video games. With Pong, a crude electronic variant of table tennis, Atari beget the new national pastime a decade ago. According to Wall Street investment analyst Richard Siwn, Atari has been "the fastest growing company in U.S. history" ever since. Atari, launched on an initial investment of $500, is now a billion-dollar-a-year leviathan synonymous with high-tech rec. Still the only company that manufactures both coin-operated games for arcades and home video-game consoles, Atari has initiated a revolution in America's leisure-time habits whose eventual impact can only be guessed at today, creating a generation for whom computers are a part of the scenery of everyday life. It's caused something like mass hysteria among denim-clad teenagers and pinstriped stockbrokers alike. Atari is now a subsidiary of Warner Communications, Inc., but if it were an independent company, its revenues would put it somewhere around 290 in the Fortune 500. Atari's emergence as a corporate colossus may be the most perverse success story since the 1969 New York Mets. Founded in 1972 by Nolan K. Bushnell, a flaky, games-obsessed engineer who was subsequently given the bum's rush by his own board of directors, Atari today controls the lion's share of the $3-billion-a-year home and arcade video game market. It wasn't easy. Atari almost went bankrupt shortly after it was founded in 1972. It weathered a calamitous power struggle among warring management factions after Warner acquired it for 28 million in 1976. When Atari's idiosyncratic managers balked at the new owner's efforts to impose its buttoned-down corporate ethos on them, Warner's vice-president Emanuel Gerard, the prime mover in the takeover, was dumbfounded. "They really had no manufacturing, no sales, and no advertising or marketing expertise. Everything but research was lacking. It was amateur night in Dixie," Gerard groused publicly. Years from now, earnest young business school graduate students will still be struggling to understand how Atari succeeded in spite of itself. This story is dedicated to them. Once upon a time, not so long ago, California's Santa Clara Valley was an obscure, tranquil agrarian region like the farm country where Dorothy and Toto lived before the twister hit. A generation ago, the average businessman was a struggling apricot-, plum-, or cherry-grower; the typical laborer was a migrant fruit picker. The Valley, the rolling hill country of the peninsula between San Francisco and San Jose, was far from the mainstream of West Coast commerce. "The Valley of the Heart's Delight," as the chamber of commerce called it, was best known for producing half the world's prunes. Then, in a cybernetic version of The Wizard of Oz, the technological twister passed through town. Today, the area is changed beyond recognition. Sleepy San Jose, the county seat, has become the bustling Emerald City of high-tech capitalism, growing to the size of Pittsburgh in the process. Today's typical Valley businessman wouldn't know his way around a plum orchard. The companies that lead in developing profitable applications for high technology are scrappy young independents rather than new divisions of established corporate titans. The Valley's form of natural selection favors small, fast-moving companies that can spot opportunities sooner and strike more quickly than the competition. It's no surprise, then, that every year more companies with Oz-style names like Avantek, Intel, Lintronix, Qume, Rolm, Syntex, and Zilog spring up to exploit new uses for microchips. Fledgling firms leap from engineers' garage-shop hobbies to hot public corporations in a single bound. A few--like Atari--have grown larger in a decade than the great Eastern industrial companies did in a hundred years. The booming young industry has not had time to evolve many traditions, but one is to wax sentimental over the funky hole-in-the-wall lab where it all started, where the golden equation that launched the business was first calculated. It is Abe Lincoln's log cabin, California-style. Many of Silicon Valley's proudest firms share such humble beginnings. Atari was no exception. Imagine a tacky Santa Clara tract house identical to the one next to it and the one next to that. Now imagine the lights in that special house burning late into the night, long after the neighbors switched off the Carson show and rolled over to sleep. Such was the cradle where today's video game industry was conceived and nurtured in 1969. Nolan Bushnell, then a 26-year-old research engineer for the Ampex recording-tape company, began moonlighting that year on a project he'd kicked around for years. After a full day in the lab he'd eat a fast dinner with his wife and two daughters, then shut himself away in a workshop improvised out of one daughter's bedroom. A lapsed Mormon, he still kept the faith's belief in the value of hard, honest work. Long into the night he'd labor like young Tom Swift, poring over technical diagrams that covered every horizontal surface in the room. Slowly, often gripped by fatigue, he was drawing up plans for the world's first commercial video game. The schedule was punishing, yet fun in an arduous way. Otherwise the project might not have commanded Bushnell's attention. A big bear of a man with a child's passion for games, he was a fair chess hustler and quite good--for a non-japanese--at Go. In fact, a large part of his waking energy was devoted to keeping himself amused. Even in college, while other engineering students at the University of Utah hustled summer jobs with Salt Lake City electronics firms, Bushnell worked on the midway of the Lagoon Amusement Park, guessing weights. The job left young Bushnell ample time to pursue his own thoughts. First among them was an idea for a new kind of midway game, a notion he toyed with frequently during his amusement park summers. Bushnell and his classmates often used the engineering school's massive mainframe computer to simulate dogfights between spaceships on a video screen done up to look like deep space. The games were engrossing, and Bushnell felt certain they'd appeal to the public, but the economics were discouraging. It took an $8 million computer to play the games, and at a quarter a turn such a machine would take about a century to pay for itself. Even so, he didn't dismiss the idea, filing it away for future reference. He'd seen enough technological breakthroughs in his lifetime to know that today's impossibility is often tomorrow's snap. When he left college, his dream job was a post in the research section of Disneyland. Disney wasn't hiring green engineering grads, but bushnell moved to California anyway, signing on with Ampex, where he put in a routine nine-to-five while mulling over ways to break into the amusement business on his own. The opportunity didn't take long to arrive. The economic obstacles to a profitable computer-based video game vanished a few short years later, thanks to the plummeting price of minicomputer brainpower. Bushnell's electronic games became feasible, so he set to work designing one in the spare bedroom. To confront such a project was to curse, but he kept at it, doggedly weeding the bugs out of his prototype game the way a perfectionist groundskeeper might extirpate crabgrass from a vast golf course. The game's basic operating mechanism was nothing more exotic than a standard black-and-white television set. The new wrinkle was a series of logic boards, elaborately wired mazes of transistors, diodes, and printed circuits forming a kind of computer inside the game. The boards displayed the playing field and controlled the game's action. The mechanism couldn't have been built a decade before, and not only because the cost was prohibitive. The small components simply didn't exist. To get the same game action on the screen would have required a package too large to get in the front door. It was four o'clock in the morning, the sky just beginning to lighten, when Bushnell completed his work on Computer Space, the first commercial video game. Like today's top games, 1971's Computer Space pitted spaceships against flying saucers, and it was brilliantly lifelike for its time. The spaceship followed Newton's third law of motion--action and reaction--with uncanny accuracy. Bushnell proudly showed off his baby to his engineer buddies, who gave wolf whistles of appreciation. Computer Space flopped. No one would pay to play it, and fewer than 2,000 were sold. Unlike Bushnell's technically sophisticated cohorts, the average guy in the bar was simply bewildered by the game. The public had never seen anything like it before. It was ahead of its time. Bushnell went back to the drawing board with a vengeance. In 1972, he was a blur of motion. He scrounged $50,000 from family, friends and local banks, formed his own company, hired a bright young computer engineer to create the easiest computer game he could think of, and borrowed a confident term from Go for his reorganized business: Atari. The game he produced this time was simplicity itself, Ping-Pong on a video screen. Pong, for short. Still smarting from his first ego-bruising brush with the business world, Bushnell cautiously test marketed his new creation. He put a sample unit in Andy Capp's Tavern in suburban Sunnyvale to see if anyone would play it. Twenty-four hours later, the owner called Bushnell in a rage and demanded that he get over to the bar with his tool kit as soon as possible--the prototype game had broken down. When the machine was opened, the problem was obvious. The sawed off plastic milkjug that caught the quarters was inundated. Atari's first game was literally drowning in money. The rest, as they say, is history. Atari was the first in the field to give the public what it wanted in a computer game. Pong was more than a game of Ping-Pong on a video screen. It was an expression of man's love-hate relationship with the machine. For a quarter, Pong would give a mere human a temporary sense of mastery over the almighty computer. The psychology was perfect. The game was a sensation, hailed as the thinking man's pinball. Even Carl Sagan was charmed by Pong and commended the game to his readers in The Dragons of Eden. "The game is very interesting," he wrote. "As a result of Pong, a player can gain a deep intuitive understanding of the simplest Newtonian physics." When the game struck it rich, Atari didn't profit alone. Like the juke boxes and pinball machines before them, coin-operated video games sold to distributors for $2,500 to $3,000 a piece. The distributors lease machines to owners of arcades, taverns, and supermarkets for half of the gross revenue. The distributor keeps the machine in running order, cleans out the coin box when it threatens to back up, and splits the proceeds with the location's owner weekly. Today, insiders in the coin-op industry date the decline of the pinball era from the year Pong made its debut. Pinball has the same fatal defect of every other electromechanical device -- it's labor-intensive in manufacture and maintenance. Video games, on the other hand, use easily assembled solid state components that last for years. For cost-conscious distributors, cheap maintenance gave the games a decisive edge. Although Pong's temperamental logic boards required expensive repairs when they shorted out, it was clear to many that once the bugs were out, video games would achieve an important place in the market. Ed Adlum, of Cash Box, a trade magazine for the juke box industry, recognized the video machines' potential when they first arrived on the scene. "This trade," he said, "loves any machine. that's easy to repair." Inevitably, Pong's success brought problems. First, even though 100,000 Pongs were sold by 1974, only a tenth were genuine Ataris; the vast majority were American and Japanese counterfeits. Atari sold fewer Pong games than anyone else because it didn't have the cash to produce what the market demanded. Money is the climbing corporation's crampon, and a lot of it is needed for ascents on the dizzying slopes of High Technology. Second, Bushnell, flush with his first big score, was impatient to push on to greater heights. And for that Atari needed a major infusion of capital. By 1974, Pongs coin receptacles stopped overflowing, and Bushnell bet the barn on a new race-car driving game called Gran Trak 10. Manufacturing snafus stalled the machine long enough to inflict a half-million-dollar loss, as much as the company had made in '73. Bushnell hesitated for three months, then cut the company back by almost half. Rattled, he turned operations over to Joseph Keenan, the president of a subsidiary. Pong was beginning to look like a lucky fluke. Bushnell, loath to become a formerly promising young man trailing a brilliant future behind him, searched furiously for a comeback gimmick. The public wanted something new. And when an ill-considered attempt to expand into arcades in Hawaii and Japan failed, draining Atari's resources perilously, it was apparent Bushnell would have to find that something fast. As it happened, a man named Ralph Baer, the chief engineer for a New Hampshire military equipment design company, had found it first. Like millions of Americans, Baer hated television. Unlike the rest, he had the know how to wrest the box from "Gilligan's Island" reruns and make it dance to his commands. Baer approached Magnavox, the television manufacturer, with a game console attachable to TV sets that turned them into part-time toys. Magnavox liked the idea, licensed the concept under the name Odyssey, and had it on the market in time for Christmas 1972. Magnavox promoted the Odyssey console vigorously, offering it at half price with the purchase of a new television set, and sold 200,000 in the first three years. None of this was lost on Bushnell. The home market looked like a logical area for expansion, so he ordered Atari's R&D team to work. They quickly discovered how to produce a facsimile of Pong on standard-issue TV sets. Bushnell trumpeted the news that Atari's first home game console would be unveiled at the next toy industry exposition. Now Bushnell simply had to finance the game's production. Atari needed an investor willing to risk a fortune on an untried invention aimed at an uncharted market and produced by a one-shot company. The omens were not favorable. Many retailers over-estimated the demand for the prior electronic craze , digital watches, and found themselves overstocked with slow-selling timepieces after the novelty wore off. Understandably, they were reluctant to place large orders for another gizmo that might become a disappointment. In such cases, though, there is sometimes a contrarian who hopes to make a killing by rejecting the conventional wisdom. A Sears Roebuck & Company toy buyer appeared on the doorstep of Atari's Los Gatos headquarters before the industry show opened. How many games do you plan to manufacture this year, asked the buyer. Oh, 75,000, responded Bushnell. Make it 150,000 and give Sears the exclusive rights, said the buyer; we'll help arrange the financing to make sure we get delivery. Where do I sign, Bushnell asked. The home version of Pong made its debut in the fall of 1975. Sears retailed the game through almost 900 outlets nationwide and picked up the tab for advertising it. Thirteen million home Pongs were sold in the next three years, and Atari attained that state of grace, a positive cash flow. In fiscal 1975, the company's revenues were about $39 million, and net income was a healthy $3.5 million. Not bad for a three-year-old. By the bicentennial, Bushnell was on something of a roll. Atari scored big in 1976 with a reprise of the Pong idea called Breakout. Players used a paddle to bounce a Pong ball against a wall, knocking away a brick with each bounce until all the bricks were gone. It sold 15,000 games, and Bushnell was feeling his oats. He'd established credibility as the canniest operator in the video-game industry, and some of the flaming chutzpah typical of the Silicon Valley mentality had rubbed off on him along the way. His Mormon upbringing--by now a fading memory---did little to shield him against the blandishments of success. As the owner of just over half the company's stock, he had amassed a considerable personal fortune. The press christened him King Pong, and he lived up to the name. He divorced his wife indulged his eye for the ladies. He assigned code names to games in development, usually the names of attractive female employees. A California newspaper account of Bushnell's high roller lifestyle showed him cavorting in a hot tub with a nubile young woman. He bought a slick 41-foot sailboat and named it--what else?--Pong. He was pugnacious with business adversaries, but he ran Atari with a carefree hand. Atari became something like Bushnell's vision of Disneyland, the perfect place for creative, fun-loving engineers to work. The management style was California casual. At Atari, business and pleasure not only mixed, they were inseparable. It didn't matter if people showed up for work late or wore T-shirts in the office, as long as they had a lot of fun ideas. Skull sessions between top management and the engineering staff sessions ran gonzo. Pajaro Dunes, a scenic Pacific Coast vacation resort a few hours south of Los Gatos, was the scene of marathon bull sessions where brainstorming about game theory and psychology was fueled by infusions of cannabis and Coors. Ideas were batted back and forth like hyperactive Pong balls. In Atari's funky San Jose factory, long-haired workers assembled components to the tune of piped-in rock music. And in the executive suite, Bushnell and his fellow executives found time to play their favorite games daily. "The day you go to lunch without playing a game to decide who pays," he told the Washington Post, "you know that game has lost your interest." This radically unbusinesslike approach seemed to be working. It made sense, in a way. After all, could sober and serious businessmen far removed from the phantasmagoria of their own childhoods make toy come alive for the adolescent minds of Atari's clientele? In 1976 demand overwhelmed the video game makers. There was an apparently insatiable demand for the games from armchair athletes, and Atari and Magnavox, the only homegame manufacturers the year before, were joined by a host of competitors. Ever since 1974, with economical microprocessor chips a reality, hundreds of circuits could be added to the games. The new consoles worked like a cassette tape recorder: to change the game, one merely inserted a different game cartridge, containing a semiconductor chip. Fairchild Instrument & Camera Corporation, then the number three manufacturer in the semiconductor industry, pioneered the programmable unit. RCA and Bally entered the fray in '76 and '77, introducing their own programmable video games. As demand mounted, supply problems developed, beginning with a shortage of the complex integrated circuits that were the brains of the games. General Instrument Corporation, the only semiconductor manufacturer that made a major commitment to game circuits, rationed its production for six months in 1976. Lawsuits flew, alleging that GI unfairly allocated its circuits to favored clients. "The trouble is that demand is 50 to 60 percent higher than anyone anticipated," said Edgar Sack, vice president of GI's Microelectronics Group. Competition for the home video game market heated up tremendously. The consoles had a short product life, even by the fast-moving standards of the electronics industry, as manufacturers leap-frogged each other's models with ever more sophisticated entries. First-generation Magnavox Odyssey 200 games that sold for $129 in Christmas 1975 were being sold off for $39 the following year. They were, in the words of one disgruntled retailer, "almost like a Stone Age game now." Atari's home Pong was equally simple, a "dedicated" game with a fixed internal logic. Like a music box with a single tune, it played Pong and only Pong. The advantages of adding a strong home-games arm to the firm were obvious. There was only so much arcade space to be had, but with games attachable to home TV sets, every household in the nation became a potential customer. The players need never become jaded because new cartridges could be released monthly. Atari would become a vast marketing scheme, an ever-expanding system geared to keep even the most affluent kid one step behind. The day Dad broke down and bought an Atari console, he'd commit himself to a never-ending purchasing plan. Given this component approach, owning the complete system would be as distant a prospect as paying off the mortgage on a house. Furthermore, creating new arcade games proved to be a laborious and risky process. It could take from three months to a year for a game to be programmed, prototyped, and produced. Some games were stalled in conceptual doldrums for months until someone suggested the right combination of sounds, action, and graphics to bring the idea to life. Development costs could exceed a quarter of a million dollars for a single game. And, noted Don Osborne, vice president of Atari's coin-op marketing division, "for every eleven games you create, you only get one winner". An arcade video game with a manufacturing life of more than four to six months is a rare exception. The options were clear: Raise the wherewithal to create a new line of games or replay the Pong episode, watching competitors walk off with most of the spoils. Once again Atari needed cash in a hurry. That meant either assuming huge loans, the uncertain prospect of going public, or selling out to a cash-rich, established company. Atari went on the block, displaying its wares to three companies "with some synergies," as Bushnell put it. MCA, the entertainment conglomerate that owns Universal Studios, looked at the chaotic video game market and at Bushnell's fledgling company, and (to the everlasting regret of its stockholders) declined to acquire it. Irony of ironies, Disney followed suit. Third time lucky, Atari got an attractive offer from Warner Communications, an arch rival of the other companies in the battle for America's entertainment allowance. Atari came along at a time when Warner could use a big score. Its biggest division--records and music publishing--was performing poorly. The record market was heading toward collapse in 1977. And without blockbusters, Warner's 1976 film production profits fell to the lowest level in years. And the company's ambitious investment in cable television--in partnership with American Express, Warner operates the country's fifth largest cable system--was not expected to show a profit until the mid-Eighties. So the quarters that poured down Atari's coin chutes looked very tantalizing indeed. Warner's executive vice president Emanuel Gerard, an erstwhile Wall Street entertainment industry analyst who was charged with finding acquisitions, decided Atari and Warner belonged together, and set the deal in motion. The corporate Anschluss proceeded by inches for weeks while each firm's lawyers and managers performed an elaborate hesitation waltz. At one point, the former Mrs. Bushnell entered the fray with a suit challenging her ex-husband's claim to his shares, and it appeared that the various parties might tumble into a thorny thicket of litigation. On the advice of Warner's lawyers, however, she settled out of court for a comfortable sum. Four months after the merger was initiated, Atari was Warner's subsidiary. "Business is the ultimate game, in which you keep score with money," Bushnell often said, and a look at the scoreboard showed him to be a big winner. He emerged from the Warner deal $15 million richer at age 33. According to the terms of the acquisition, he would stay on under long-term contract as board chairman. But the forces that were to dethrone King Pong promptly made themselves felt. Atari got the capital it needed. Warner's loans to Atari totaled $120 million at their peak, and with Warner's considerable investment behind them, Atari's engineers created the Video Computer System, a $200 programmable system with colorful graphics and plenty of game cartridges. Not only was the new system versatile, it promised to be wildly profitable. Each cartridge would cost less that $10 to manufacture and sell for $25 to $35. VCS sales got off to a sluggish start, however. The system was introduced in time for Christmas 1977, but retailers were stocking up on hand-held electronic games for the holidays. Fairchild and Bally had programmable--but incompatible--consoles on the market, and confused consumers shied away from them. RCA couldn't sell its black-and-white Studio II game to color TV owners. Production and supply hitches held up the introduction of Mattel's Intellivision unit for two years. Atari ran into problems, too. Static electricity from a carpet could blow the circuitry of early VCS consoles, throwing them into a frenzy of lazer-beam firing that spoiled the fun for the human at the controls. The baseball game Home Run was delegated to an engineer who didn't understand the rules. He created a game in which a batter who swung and missed was credited with a ball instead of a strike. It went back to the drawing board for corrections. During the next year, nobody's system sold very well. The charismatic Bushnell went on a road tour to tout Atari's new system, playing Shootout with reporters from the New York Times and the Washington Post. He seemed to be out to steam-roll the competition with psychological warfare as well as to outsell them. "Nobody is going to take the programmable video-game business away from us now; all they can do is lose money," he declared. "We're the only ones with the guts to be a major factor." Still, throughout 1978, Atari was up to its corporate ears in unsold VCSs. If the market was turbulent, the situation inside Atari was worse. Donald Valentine, an early underwriter of the company as head of the venture capital arm of Capital Research & Management and a member of Atari's board during this period, has called the state of the company "absolute chaos." Bushnell, who felt he had nothing more to prove, never planned to spend much time at Atari's helm after the Warner deal. He began arriving at the office only occasionally and shunned the more tedious aspects of corporate management: dealing with stockholders, the SEC, IRS, and the like. He left the day-to-day business of running the company to president Joseph Keenan, himself a low-key manager who emerged from the Warner windfall a millionaire. With the confidence truly extravagant wealth provides, Bushnell found it easy to concede, "I'm not a very good CEO." But his blithe acceptance of his own limitations failed to disarm Manny Gerard. The head of a company like Atari ought to be fun-loving, but there's a place where you've got to draw the line. With more than 100,000 VCS consoles gathering dust in Atari's warehouses, a confrontation was not far off. Several weeks before the annual budget meeting in New York, Gerard proposed a reorganization plan. Keenan would assume the chairmanship; Bushnell would step down from that post but continue as director. The new chief executive would be Raymond Kassar, head of the home games division for less than a year. A punctilious manager, Kassar knew virtually nothing about nuts-and-bolts electronics, but was adept at taking apart corporate balance sheets. A kind of smoldering resentment had developed between long-time Atari personnel and the more structure-oriented newcomers from Warner. It flamed into open warfare at the budget meeting. What began as a harsh critique of Atari's performance degenerated into screaming, bare-knuckles confrontation between Bushnell and Gerard. The VCS was initially the point of contention. Bushnell took the offensive, insisting the system was moribund because it was over-priced. If you want it to sell, he bellowed, cut the price. Gerard counter-attacked emphatically: Cut the price now and you'll destroy the VCS's credibility, killing the component system in the cradle. The argument soon adopted language rarely heard in boardrooms. The meeting ended in palpable tension. Fun and games had become very serious business indeed. The following day Bushnell agreed to Gerard's reorganization scheme. But when he returned to California he began to reconsider. Had he done the right thing in stepping aside? While he vacillated, Gerard called a special session of the executive committee of Warner's board, which ousted Bushnell in absentia. The official public explanation was that he had left the firm to return to his first love, inventing. Kassar, a suave man who runs a tight ship, gives the impression that he couldn't look messy or wear a vinyl penholder if he tried. Nor does he seem the type to hang around the lab after hours playing Dungeons and Dragons or discussing machines. Trim, dapper, and pewter-haired, he looks like a man who'd be comfortable playing high-stakes baccarat in Monte Carlo. Twenty-five years at Burlington Industries gave him a taste of order, organization, and efficiency. His efforts to revamp Atari along similar lines provoked substantial animosity. Kassar arrived at Atari so innocent of the workings of the company's machines that he kept an old Scientific American primer on electronics in his desk drawer as an aide-memoire. For that reason alone, the technical staff might have considered him an outsider. And he gave them more reasons. Engineers who were pampered throughout the Bushnell era were outraged when Kassar dismissed them as over-emotional prima donnas in a newspaper interview. An atmosphere of science fiction top-secrecy was imposed in the research labs to protect confidential information. Engineers now must use magnetic ID cards to open the locked doors as they move from one secured corridor to another. And except for a few luminaries, their names are kept top secret, lest competitors lure them away. Kassar put his conservative stamp on the rest of the corporation as well, recruiting experienced managers from other large corporations, creating formal reporting procedures, establishing financial controls, and outlining detailed sales and marketing goals. Employees were expected to arrive at their work stations promptly and to dress appropriately. Kassar trod on some toes, but he proved as clever at playing financial games as Bushnell had been at devising electronic ones. Within three years, bolstered by a massive advertising campaign, the Video Computer Systems that once glutted Atari's warehouses were in such demand the company had to ration them. As Atari changed, so did the staff. Disaffected staffers began to drift away soon after Kassar's promotion. "There aren't many people around here from the Busnell era anymore," observes Margaret Lasecke of the company's public relations division. A company's transition from the entrepreneurial to the managerial style is fraught with peril. That trickle of old-timers leaving the firm was a harbinger of trouble to come, for Atari's idea people were a select bunch. It takes a special kind of mathematical alchemy to translate the elaborate whimsy of a game like Breakout into a skein of logical connections in programmer's language and then midwife it through the electronics of a computer. The loss of key employees is more worrisome than the loss of trade secrets. "In this industry, people are the most important resource. People make or break you," said the head of one high-technology company. It was a situation that promised to be bothersome. But there was a more immediate problem at hand. America was being overrun by Space Invaders. By the time Space Invaders arrived from Japan in 1979, the public was avid for complex new video games that would have stymied them not long before. The import was a huge success, largely because it was the first widely distributed game that was controlled by a microprocessor. A minicomputer about the size of a matchbox ran the show, directing a phalanx of alien tadpoles in an assault against a garrison defended by a movable laser cannon. Creating such a range of motion with logic boards for each task would have been a daunting project; the great breakthrough of Space Invaders was that its microprocessor brain merely had to be fed the rules of the game in order to play it. Life imitated the game during the Space Invaders assault of 1979. A record-shattering 350,000 games were sold worldwide, 55,000 games in America alone. Atari, in danger of being overrun on its home turf, returned a weak salvo with forgettable games like Starship and Super Breakout. The implacable Invaders continued their seemingly inexorable advance. The cavalry arrived in the form of Lyle Rains, an Atari veteran who joined the company in 1973 and now is vice president of engineering, coin-op division. Concerned about the success of Space Invaders, he retired to the lab and juggled some ideas for games with similar appeal. The most promising was Cosmos, an Atari space game that never quite got off the drawing board. Cosmos's theater of war was a field of stationary asteroids. But asteroids aren't static, mused Rains; they move. Eureka! Asteroids was introduced in 1980. It was the counterattack that worked. It was also a technological watershed. In Space Invaders, a player's control was limited to moving a gun back and forth across a fixed axis along the bottom of the video screen. But Asteroids players send their ships flying to any point on the screen, thanks to a process Atari calls vector scanning. It made the game so complex it required twin microprocessors to do its thinking. Atari pulled ahead of the Japanese invaders in the U.S., selling 70,000 Asteroids games at $2,700 retail. It finished second to the Japanese game worldwide, with 100,000 sales, but Atari had repulsed the enemy from its back yard. In a canny move, the company used it's profits to buy the exclusive rights to Space Invaders for its home-games division. It became a multimillion seller, one of the industry's hottest cartridges. Nineteen-eighty was the year Atari's profits began to take off. Revenues more than doubled, to about $415 million, accounting for a third of the conglomerates's 1980 operating income (and far overshadowing the film division's $60 million profit). Lee S. Isgur, voted America's number one financial analyst of leisure-time stocks for six years in a row by his Wall Street peers, has been recommending Warner's stock aggressively since 1974, and he thinks "it's got much further to run than it's run already." He likes companies that get a substantial share of their earnings from coin-operated video games. "This is one of the most rapidly growing markets in the world today," he told the nation last fall on Public Broadcasting's Wall Street Week. Clearly, the stock-buying public agrees. Buoyed by the 1980 statistics, Warner stock rose 35 percent in six months. Atari's growing importance has made Warner stock volatile. As Warner's 1980 annual report admitted: "The major problem facing all of Atari . . . is the ability to create the infrastructure and depth of management to handle the anticipated explosive growth." The games are subject to sudden, fickle vacillations in popularity that attend such fads, going from tutti-frutti to plain vanilla in six months or less. The coin-op division isn't scooping out too much vanilla these days. After Asteroids, Atari brought out Battlezone, a tank vs. tank game played on an imaginatively simulated three-dimensional landscape. The effect is impressive. Roll forward and you see the countryside advance to meet you in perfect perspective. To achieve this illusion required some fancy mathematics and more than the usual amount of internal electronics. Battlezone is a three- microprocessor game, and a fair-sized hit. Some 25,000 were sold at a retail price of about $3,000, making it one Atari's top ten all-time best sellers. And then, heading quickly for the present, came Missile Command, Tempest, Dig Dug, Space Duel, and others, too fast to chronicle and too numerous to mention. The all-time arcade champ at this stage of the industry's history is, of course, Pac Man, a Japanese import licensed in this country by Midway Manufacturing of Chicago. As the crowds at the arcades began to change in the last two years, with more adults and women beginning to play, Pac Man usurped Asteroids' position as the top-selling game in America. Atari's games lack the essential ingredient that makes Pac Man so addictive. They do not have a personality. Asteroids, Battlezone, Missile Command, and the rest, for all their technical finesse, are just games of marksmanship. Pac Man is cute. Atari is attempting to fight Pac Man with a game called Centipede. Like Pac Man, it's designed to appeal to the Little Miss Muffet in women as well as men's macho tendencies. Programmed by Atari's only female engineer, Centipede is akin to a computerized Raid commercial. Today, all Atari is divided into three parts, and the three units operate more or less independently. Of the three, the coin-op arcade machine business and the VCS home versions account for the bulk of the profits. The arcades are still going strong. Despite a sick local economy, the number of quarter-gulping video game parlors in Detroit soared from 17 in 1980 to 3,545 in mid- 1982. But the home market is where the fastest growth is expected--and Atari's VCS already accounts for three-quarters of the market. Eighty million U.S. households have televisions, but only 8.5 percent have bought video games. Some industry analysts predict that by 1985, fully half the households with TVs will own video games. And with a million home-game consoles sold so far in Europe, the overseas market is just beginning to open. Add the vastly profitable cartridge software market--industry analyst Richard Simon says console makers realize more profit from cartridges than the consoles themselves--and you have every reason to expect continued growth. The third unit, which produces Atari computers, has been the weak sister since its inception in 1980. The division lost an estimated $10 million its first year out of the gate. It scrapped $2 million worth of business-oriented hardware and program development last year to focus on the home computer market. There it finishes a poor third to Radio Shack and Apple (begun by former Atari engineer Steve jobs after Bushnell laughed off his proposal to build inexpensive general-purpose computers). Only recently has it edged into the black after several years of production delays, reliability problems, price-slashing promotional efforts, and disdain from computer mavens who called its model 400 and 800 computers "Aturkeys." Nevertheless, Chairman Kassar believes the embryonic division may prove to be Atari's biggest and most profitable arm in a few short years. Financial analyst Michele Preston thinks Atari's policy of keeping its video-game products and computer operations separate is a sound strategy. After 1983, many observers believe sales of home video consoles will give way to sales of home computers that can be used for games. "Keeping (the two divisions) separate enables Atari to offer a more powerful home computer now," Preston said in a recent interview with the Wall Street journal. "Over time, computers will replace many video games, and Atari is the only one to realize that by constantly moving to upgrade its computer business." Isgur concurs. "In the Eighties one of the most interesting areas is going to be a merging between the video game and the personal computer. I think this is going to be very, very important." Virtually alone in the field, Atari believes the time is ripe to push personal computers to the public. By making its computers cheap ($200 for a 16K model to $600 for a 48K) and simple enough so that almost anyone can use them, Atari hopes to make the devices as common as Cuisinarts. Its products are easy for non-programmers to understand; users just snap in a program cartridge and type two command words to operate the machine. "Consumers are impatient," Kassar says. "The computer has to be as easy to operate as a typewriter and television. Data access has to be simple as dialing the telephone or changing the channel. It's important to understand that people can get along without a home computer," he says pragmatically, and they "will not buy it until we effectively communicate benefit and value." With just such an educational purpose in mind, Atari is offering computers to schools at rock-bottom prices. Despite his high hopes for the computer division, Kassar isn't putting all the company's eggs in the basket. While pressing forward into the vanguard of the information revolution, Atari has developed the 5200 Video Computer System games console with more sophisticated graphics. After all, if a mass market will emerge only after consumers have been taught in easy steps what a computer can do for them, games provide an easy introduction at a popular price. Prospects for the future seem bright. Charles Lazarus, president of the New Jersey-based Toys "R" Us chain, was wowed by the last Christmas's sales figures. He hails video games as "the hottest thing around, the successor to the Ping-Pong table as a source of family fun." . Susan McKelvey, publicity director of the K Mart Corporation, agrees. "Anything that has to do with space is a really big thing, especially if it emulates the arcade games," she says, adding that video game sales were up in 1981 dramatically over 1980. Still, size doesn't guarantee success. In a market so tough to judge, even giants may stumble. RCA folded its video game production in the shakeout of 1978. Fairchild lost millions on digital watches and video games despite its eminence in the semiconductor industry. Xerox tried to enter the microcomputer market in the Seventies and got its nose bloodied. Atari's time may come, and it may be Atari dropouts who beat their alma mater at its own games. In 1981, Atari was traumatized when a group of key employees, having seen others get rich, decided they ought to get very rich themselves. Some valued programmers bailed out to create two software companies, Imagic and Activision, and went into business for themselves, designing games compatible with their former employer's products. A top selling game will produce astronomical profits. Manufacturing costs are relatively modest. Each cartridge consists of a simple plastic housing plus a few small springs to anchor the chip that carries the game program. The total materials bill at some software companies is less than $4. Activision, run by former recording industry executive James Levy, promotes its designers as if they were rock stars. 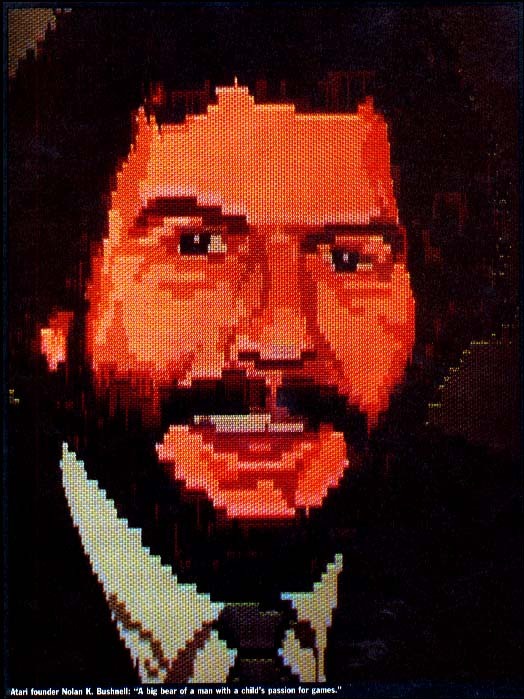 In contrast to Atari's hushed secrecy, each Activision game is packaged with an instruction sheet that carries a picture of its creator, along with his tips on playing the game. Activision had $5 million in cartridge sales in its first year. Levy predicted sales of $50 million in 1982. Imagic expected $10 million in sales in 1982, according to its president, William Grubb. And a number of large companies have approached the new firms with acquisition feelers as well. Already, a second generation of small, aggressive video game companies has sprouted up. Up for grabs is a relatively new industry that knows few bounds. The newcomers may be in trouble soon, but then, so may that venerable ten-year-old, Atari. Colin Covert, Asteroids enthusiast and staff writer for the Detroit Free Press, feels he's a major factor in Atari's success.